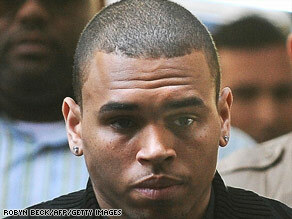 LOS ANGELES, California (CNN) -- A photographer sued Chris Brown on Wednesday, claiming the R&B singer's bodyguards roughed him up outside a fitness center when he took a photo of Brown. A photographer's lawsuit names Chris Brown and L.A. Fitness, where the alleged assault took place. The lawsuit was filed in Los Angeles County Superior Court -- the same court where Brown will be the subject of a hearing Thursday on charges that he assaulted his then-girlfriend, singer Rihanna. The February assault left Rihanna bloodied and bruised. Brown, 20, is not expected to attend the scheduled hearing. But, in a video that surfaced online Wednesday, the singer told his fans he is not "a monster." Speaking directly to the camera, Brown talked about a new album, "Graffiti," that he expects to release soon and a single that will come out in the summer. "I'm telling you, I'm telling you, I just want to say, 'What up! Cause I ain't been out there in a minute," he said. "Everybody that's haters, they just been haters. All my real fans, I love you. I ain't a monster." It's unclear when the video was shot. It was first posted on Justin.tv, a video-sharing site similar to YouTube. The photographer's lawsuit on Wednesday names Brown and L.A. Fitness, where the alleged assault took place. The plaintiff, Robert Rosen, said he snapped a photo of Brown and friends playing basketball at the fitness center on March 13. Rosen, who said he was a gym member and had a right to be there, alleges he was chased by Brown's bodyguards and assaulted. He also fell down a flight of stairs trying to run away, the suit says. The lawsuit claims assault and battery, emotional distress and negligence. Rosen is asking for compensation for his injuries, medical expenses and loss of earnings, among other things. Brown's lawyer, Mark Geragos, called the lawsuit frivolous. "This is a specious and frivolous lawsuit by one of the paparazzi seeking publicity and a payday," he said in a statement. "He's done this before and lost. We will vigorously defend against this." A photographer by the same name filed a similar lawsuit against actor Pierce Brosnan in 2007. That suit was dismissed, reported CNN television affiliate KTLA in Los Angeles. The hearing in the Brown-Rihanna case Thursday is one in which a judge will decide whether there is sufficient evidence for Brown to stand trial. Last month, Brown pleaded not guilty to charges of assault and making criminal threats. If he is convicted, the sentence could range from probation to four years and eight months in prison, the Los Angeles County District Attorney's Office has said. Rihanna, whose full name is Robyn Rihanna Fenty, wanted the case resolved without a trial, her lawyer said at the time. "She believes that the quicker this case is over, the more quickly she can get back to her life and her career, which is exactly what she'd like to do," Donald Etra said. The alleged attacked occurred during an argument in February, when 21-year-old Rihanna found a three-page text message on Brown's cell phone from a woman he had a previous sexual relationship with, according to court documents. Brown is then accused of biting, choking and repeatedly punching Rihanna while trying to push her out of his car.